Kyushu (九州, Kyūshū, literally "Nine Provinces"; Japanese: [kʲɯːꜜɕɯː]) is one of Japan's four main islands. It is the most southern of the main islands. Kyūshū is the third largest island of Japan. Kyūshū region is made up of the entire island. The name Kyūshū literally means "nine countries" in Japanese. 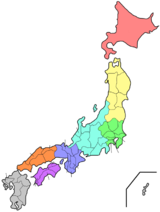 Kyūshū was made of nine old "countries" or provinces that are now prefectures. In other words, each prefecture has a modern name and sometimes more than one old provincial name. The old names are still used sometimes, especially for foods, music, or art. The original nine provinces in Kyushu were Chikuzen, Chikugo, Hizen, Higo, Buzen, Bungo, Hyūga, Ōsumi, and Satsuma. Today, Kyushu is made up of seven prefectures. Parts of Kyūshū have a warm climate, like the Miyazaki and Kagoshima regions. Major crops grown there are rice, tea, tobacco, sweet potatoes, and soy; silk is also made. The island is known for many types of porcelain like Arita, Imari, Satsuma and Karatsu. Under the Gokishichidō system, the island of Kyūshū was a part of the region known as Saikaidō. It was a part of this region from the 7th century until the middle of the 1800s. Around 1905, it was made into its own region. In the modern system, Kyūshū and the small islands around it are a part of the Kyūshū region. ↑ Nussbaum, Louis-Frédéric. (2002). "Kyushu" in Japan Encyclopedia, pp. 588-589. ↑ LOC, "Kyushu"; retrieved 2012-2-13. ↑ Nussbaum, "Fukuoka-ken" at p. 218; Japan External Trade Organization (JETRO), Fukuoka Prefecture, Regional Information; retrieved 2012-4-6. ↑ Nussbaum, "Kagoshima prefecture" at p. 447; JETRO, Kagoshima Prefecture, Regional Information; retrieved 2012-4-6. ↑ Nussbaum, "Kumamoto prefecture" at p. 572; JETRO, Kumamoto Prefecture, Regional Information; retrieved 2012-4-6. ↑ Nussbaum, "Miyazaki prefecture" at p. 651; JETRO, Miyaszaki Prefecture, Regional Information; retrieved 2012-4-6. ↑ Nussbaum, "Nagasaki prefecture" at p. 683; JETRO, Nagasaki Prefecture, Regional Information; retrieved 2012-4-6. ↑ Nussbaum, "Ōita-ken" in Japan Encyclopedia, p. 742; JETRO, Oita Prefecture, Regional Information; retrieved 2012-4-6. ↑ Nussbaum, "Saga prefecture" at p. 804; JETRO, Saga Prefecture, Regional Information; retrieved 2012-4-6. This page was last changed on 1 February 2018, at 18:53.